Alonzo L. Hamby is the Distinguished Professor of History at Ohio University. He is author of the award-winning biography, Man of the People: A Life of Harry S. Truman, Hamby has been the recipient of numerous awards and grants. They include the Herbert Hoover Book Award and the Harry S. Truman Book Award in 1996, both for Man of the People (1995). In addition to the Truman biography and numerous articles in scholarly journals, he has written or edited seven other books, including Beyond the New Deal: Harry S. Truman and American Liberalism, 1945-1953 (1973); The Imperial Years: The United States Since 1939 (1976); Liberalism and Its Challengers: F.D.R. to Bush (1992); and, most recently, For the Survival of Democracy: Franklin D. Roosevelt and th World Crisis of the 1930s (2004). Hamby also has receivedv two National Endowment for the Humanities Fellowships, a Harry S. Truman Library Institute Senior Fellowship, a Woodrow Wilson International Center for Scholars Fellowship, and the Ohio Academy of History Distinguished Service Award. Born in Missouri, Hamby graduated from Southeast Missouri State University and earned his Ph.D. from the University of Missouri-Columbia. He is an expert on Harry S. Truman and his presidency, a research interest that started only years after Truman ledt the White House. In a recent interview he commented "I started at Missouri only ten years after Truman had left office. My dissertation, subsequently enlarged and published as Beyond the New Deal was not a biography. Truman's personal papers were not yet available. It was a book about the liberal left of that time and the Truman presidency. I wrote a full-scale biography of Truman years later." My mother probably thought that with a little luck, I might become a high school principal or superintendent someday. She had spent years teaching in one-room rural schools before meeting and marrying my father. They ran a mom and pop grocery store that required the time and work that in these days one expects only from immigrants. They also had books and newspapers in the house and wanted their children to do well in school. Naively or not, I believe that there remains plenty of upward mobility in America for those who work at it. I managed (along with a couple of thousand other lucky students) to win a Woodrow Wilson Fellowship in 1960, and used it to pursue an M.A. at Columbia University. Columbia was quite an experience for a small-town kid. It had a huge M.A. program I probably couldn't have been admitted otherwise. I'll never forget a one-size-fits-all historiography course that had an enrollment approaching 200 students. It was the worst single class I would have in graduate school. Most of the other classes were ridiculously large, but nonetheless stimulating and frequently exciting. The Wilson money was much appreciated, but was only for one year. Financial aid at Columbia was tight, and I had no independent income. I got word of National Defense Education Act fellowships, tied to the study of the Truman presidency, at the University of Missouri. I applied and landed one. I found myself part of an excellent graduate program. The student talent level in truth surpassed that of my M.A. seminar at Columbia. At both schools, I was singularly fortunate in my choice of teachers. The three most important to me were John A. Garraty, Richard S. Kirkendall, and William Leuchtenburg. I had the good fortune to land a job at Ohio University upon completing my Ph.D. in 1965. Never having taught a course, delivered a paper, nor published an article, I would be considered utterly unqualified for a university position today. I decided that my dissertation, "Harry S. Truman and American Liberalism, 1945-1948," should be the first half of a book that would take the theme through the entire Truman presidency, thereby condemning myself to, in effect, writing a second dissertation. One of the many benefits of this decision was that it reconnected me with William Leuchtenburg, whose large lecture class I had taken at Columbia. He was interested in the project for his recently started Columbia University Press Contemporary American History Series. No one, I would discover, could be more fortunate in his choice of an academic editor. Leuchtenburg was (and remains) the nicest man and the most demanding editor in the profession. The result was published as Beyond the New Deal: Harry S. Truman and American Liberalism (1973). I could take the time needed for such a venture because I already had tenure, awarded on the basis of an edited work and three or four articles. I doubt I could get it today! The book got me started on a professional track that emphasized the history of modern American liberalism and the presidency as a focus for the study of 20th-century American history. The rest, I guess, is history. Above photo: Professor Hamby in cap and gown from his Inaugural Lecture at the University of Leiden with wife, Joyce. "Reduced to paper, the Roosevelt record was hardly impressive, even if one assumed that most New Deal beneficiaries expressed their gratitude in votes. But Roosevelt was impressive. His charisma, rhetorical talents, and dynamism made the New Deal more than the sum of its parts. American democracy differed perhaps most fundamentally from its British counterpart in demanding a strong leader at the top during times of crisis. Roosevelt, for all the inconsistencies of his agenda, emanated a sense of purposeful forward direction. However unsound his judgments may have been at critical times, however mixed his record, he had emerged as democracy's most dynamic force in a menacing decade." "I remain fundamentally positive in my view of [Harry Truman]. . . . I have sought to demythologize him, but not to debunk him. He is relevant to those who seek meaning in our past precisely because of the mixture of virtues and vices, strengths and limitations, one finds in his personality. Truman is significant not simply as one of the most important American presidents of our era, but also as a case study in American democracy . . . . Man of the People JPGBorn to no special class with no ready-made identity, his life exemplifies the stresses of self-definition, risk, failure, success, compromise, mobility, and idealism characteristic of the American experience." "The academic unfashionability of political biography (and political history in general) is . . . the result of an ideological viewpoint that prefers to ignore the success of liberal democratic politics in America. The latest generation of scholarly ideologues focuses single-mindedly on varieties of social history that with varying degrees of persuasiveness emphasize oppression or injustice, rather than liberty, democracy, or opportunity. Harry Truman's story largely refutes them." ". . . . I also believe that the distinction between social and political history is misconceived and that biography, by placing its subject within his or her context, can be a species of social history." "Strong political leadership, whether charismatic or tactical, has been throughout American history critical in popularizing a political ideology and mobilizing support for it. It is this circumstance (I am tempted to say 'fact') that justifies a biographical approach to the history of American politics, for leaders can rise and fall on the basis of individual personality characteristics unrelated to the substance of the issues they address." "In this vigorously argued, well-written book, Alonzo Hamby breaks new ground by placing Franklin Roosevelt's first two terms in the context of what was happening in Hitler's Germany and Stanley Baldwin's Britain. For the Survival of Democracy JPGHe is also considerably more critical of the New Deal than are traditional accounts. In both regards, he challenges the conclusions of other historians and the imaginations of his readers." "The need to be recognized and respected dominated Harry Truman's life. 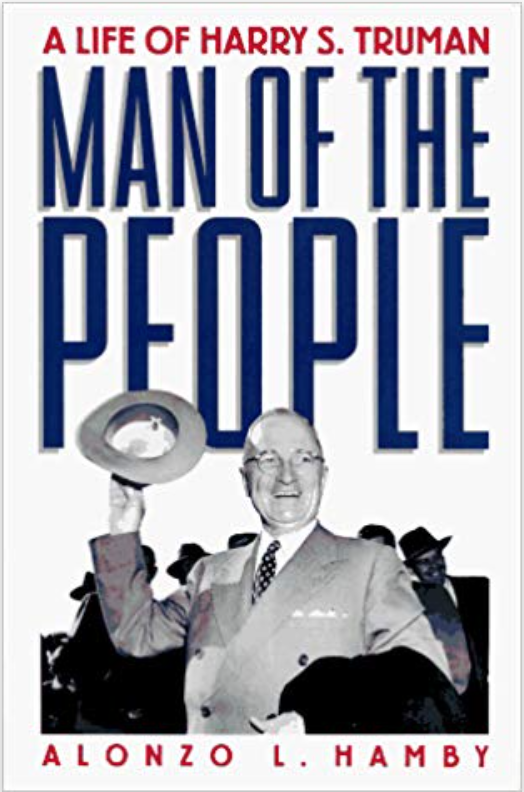 That is the main theme of Alonzo L. Hamby's superb new biography, 'Man of the People.' So much has been written about Truman in recent years -- most of it celebratory -- that yet another book about him runs the risk of being ignored. That would be unfortunate in this case, since the Truman we meet in these pages is more troubled, complicated and genuine than the man we have read about before. While Mr. Hamby's account lacks the narrative drive of David McCullough's Pulitzer Prize-winning 'Truman,' published in 1992, it is superior, I think, in providing a clear interpretive framework for understanding the relationship between Truman's personal traits and his momentous Presidential decisions.... By the time of his death in 1972, Truman had become an American hero. More than two decades later, his reputation soars. What Mr. Hamby has done, with great skill, is to remind us of the real Harry Truman, to demythologize him without slighting his accomplishments or his rough road to success. The people love Truman for good reason, as a common man who cared about them and demonstrated their potential. 'His climb to the top in this Darwinian world can be seen as a triumph of the values America represented,' Mr. Hamby concludes. 'Thus to celebrate him is to celebrate ourselves.' "
Ohio University: Assistant Professor, 1965-69; Associate Professor, 1969-75; Professor, 1975-96; Distinguished Professor, 1996- ; Director of Graduate Studies, Department of History, 1978-80, 1987-88, 1995-96 ; Chair, Department of History, 1980-83. ● Beyond the New Deal: Harry S. Truman and American Liberalism, 1945-1953 (Columbia University Press, 1973). ● The Imperial Years: The United States since 1939 (Weybright and Talley, 1976). ● Present Research: A full-life biography of Franklin D. Roosevelt, under contract to Basic Books. ● editor, The New Deal: Analysis and Interpretation (Weybright and Talley, 1969; 2nd ed., New York: Longman, 1980). ● editor and contributor, Harry S. Truman and the Fair Deal (Lexington, MA: D.C. Heath, 1974). ● co-editor and contributor, Historians, Archivists, and Access to the Papers of Recent Public Figures (Organization of American Historians, 1978). ● Approximately thirty-five articles published or forthcoming in scholarly journals or magazines and collections of essays. In addition, about three dozen shorter pieces for encyclopedias and other reference works and approximately 120 book reviews in scholarly journals, newspapers, and magazines, including Times Literary Supplement, New York Times Book Review, and Wall Street Journal. Herbert Hoover Book Award, 1996, and Harry S. Truman Book Award, both for Man of the People, 1996. David D. Lloyd Prize, Harry S. Truman Library Institute, 1974, Ohio Academy of History Publication Award, 1974, Phi Alpha Theta First Book Award, 1974--all for Beyond the New Deal. Ohio Academy of History Distinguished Service Award, 1998. Fellow, Woodrow Wilson International Center for Scholars, 1991-92. Southeast Missouri State University Outstanding History Alumnus, 1985, and College of Liberal Arts Alumni Merit Award, 1990. Harry S. Truman Library Institute Senior Fellowship, 1986-87. National Endowment for the Humanities Summer Fellowship, 1985. Evans Research Fellow, Harry S. Truman Library Institute, 1973-74. National Endowment for the Humanities Fellowship, 1972-73. Ohio University Baker Fund Awards, 1969, 1986. Ohio University Research Council Grants, 1967, 1976, 1983. Phi Beta Kappa, Lambda of Ohio, honorary membership, 1977. American Philosophical Society Grant, 1967. Harry S. Truman Library Institute Research Grants, 1964, 1966, 1967, 1969. University of Missouri Wilson Fellow, 1964-65. National Defense Education Act Fellow, 1962-64.